Announcing the winners of the 47th ever Right Place Photo Caption Contest! Presenting the top 35+ captions for this picture from CP PHOTO/HO, Paramount Classics - Eric Lee via Yahoo! Gore Does Shatner: "She packed my bags... last night preflight... zero hour nine ayem... and I'm gonna be HI-I-I-I-GH... as a kite, by then..."
-- "Hey, man, I just inhaled some greenhouse gasses... and I am SO BAKED!!!" -- "New from Post: It's Albert-O's, now with tasty greens! It's totally cereal!" -- "Why, thanks for that compliment. Many folks have told me the world has become a smaller place since I invented the Internet." -- "I invented the earth." -- "While driving in my limo to my private jet, I was disgusted to see so many SUVs driven by evil rightwingers." -- "Houston, we have some space junk above Europe... do we have clearance to obliterate from orbit?" -- Al Gore shows that he is the center of the universe, we are all orbiting him. -- "Oh God, Gore just punched Bulgaria!" -- "Nashville, we have a problem." -- Indisputable proof that global warming is caused by Al Gore. 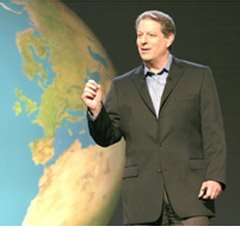 Now, in 2006, (H)AL Gore will take us to space... and recreate the earth! -- "Welcome to the Restaurant at the End of the Galaxy. The entrée for today is a nice warmed Earth." -- "In our international weather report, a large gaseous cloud has formed over Western Europe and Africa, but it is expected to dissipate by 2008." -- "Actually, this world is orbiting around ME!" -- GORE: "See, if this peninsula to my right would've just counted their votes correctly, I'd be President." OFFSTAGE: "Um, Al... that's Spain." -- Quick! Give Mexico a stick and tell 'em Al's a piñata. -- "Does it feel warmer in here, or is it just me?" -- "Earth to Algore, Earth to Algore, Earth to Algo... screw it, let him drift." -- Al Gore's doctor was a tad worried about that huge, earth shaped boil growing out his side. -- Al Gore decides the earth needs a hug. -- NASA releases a rather unique picture of two planets: Earth and Uranus. -- "We told Al to lay off the helium, but nooooooooooooooooo! He just loved that squeaky voice a little too much..."
-- "Look! It's MechaGore! Run for your lives!!!" -- The United States today unveiled their new space based weapon system. Called the Super Snore, it instantaneously renders its target, anywhere in the world, comatose by exposing it to a concentrated beam of Al Gore's personality. #10: Al Gore's ego shown in actual scale size to the Earth. #9: "If nothing is done about global warming, BILLIONS of people will die over the NEXT HUNDRED YEARS!" #8: As Al drops his drawers, the Moon in the Man becomes visible from Earth. #7: After his Big Boy capsule got blown to bits, Dr. Evil flew away in his new Al Gore capsule, vowing to come back someday to avenge himself upon Austin Powers. #6: Many assumed the Gore Nebula would, of course, be a bipolar emission nebula, but, in the end, scientists settled on a more appropriate choice for the Gore Nebula. #5: Earth collectively breathed a sigh of relief as the AlGore2000 asteroid narrowly missed it. #4: "Now somebody help me here. Where is Chad?" #3: "...And so, to prevent the frozen tundra in the Canadian Arctic from becoming fertile farmland, we must immediately destroy the economy." #2: And on the seventh day, Al rested. #1: A picture of the Earth and its Moon(bat), taken from space.